Albert Einstein was considered slow as a kid, and his teachers never thought he would be intelligent as his peers. Einstein never learned how to drive, and never even owned a car of his own. The Einstein riddle can only be solved by using logical cues and deductive reasoning. Galileo is considered the most scientist that Albert Einstein was most inspired by. Einstein was spoke actively against racism and segregation at a time when it was very unpopular to do so. The famous or infamous Einstein Riddle is one that has baffled people all around the world for over a century now. Brilliant German born scientist Albert Einstein is greatly admired for all of the influential work in physics that he gave to the world in his 76 years of life. Due to his celebrity status many people equated things to the scientist that may or may not actually came from him. One of these things being the "Einstein riddle." 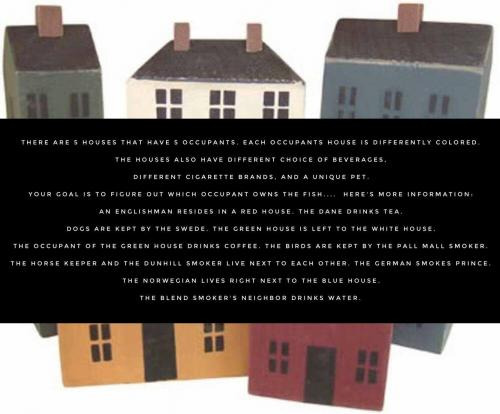 Though the origins of this popular age-old riddle aren't clear, what is clear is the fact that this brain teaser is a fun one to try and solve. Ready to give this famous riddle a try? Remember to be patient and allow yourself adequate time to think it through. What do you call a monster with a high IQ? Why did Albert Einstein cross the street? To get away from Niels Bohr. But when he got to the other side Bohr was there also. How does Einstein begin a story? How many Einsteins does it take to change a lightbulb? That depends on the speed of the changer, and the mass of the bulb. Or vice versa, of course. Then it just might be easier to leave the bulb alone and change the room. It's all relative. What happened to Einstein when he took a shower? An Englishman resides in a red house. Dogs are kept by the Swede. The green house is left to the white house. The occupant of the green house drinks coffee. The birds are kept by the Pall Mall smoker. The horse keeper and the Dunhill smoker live next to each other. The Norwegian lives right next to the blue house. The blend smoker's neighbor drinks water. Can you come up with a cool, funny or clever Einstein Riddle of your own? Post it below (without the answer) to see if you can stump our users.